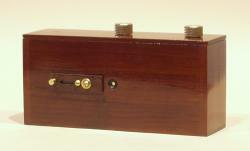 The ZeroImage Zero 6x9 is a high-end multi-format pinhole camera. Designed and made in Hong Kong by ZeroImage, the Zero 6x9 is a high-end multi-format pinhole camera. Its finish and the precision of its hole make it the ideal pinhole camera for those who don't want to make one themselves. Buying a pinhole camera may seem to be an outrage to some but the making of a such a camera is far from easy when one wants it to use classic film. In addition, the Zero 6x9 is a beautiful piece of manufacture. Made of teak wood and brass, the Zero 6x9 is essentially a box with a hole on its front side and a classic film advance knob. It takes 120 rollfilm. The shutter is a sliding piece of wood which allows to uncover the hole during the shot (in open position on the picture). Its modular chamber also offers four formats : 4.5 x 6, 6 x 6, 6 x 7 and 6 x 9 cm. The whole principle of a pinhole camera resides in its lens which is, as its name suggests, a simple hole (the black dot in the middle of the golden area on the picture on the left). Not so simple actually as the quality of the pictures depends entirely on the quality of the hole. It must be absolutely circular and made in the thinnest possible material. Its diameter has to be very small (0.18 mm on the Zero 6x9). Its making is therefore much harder than it seems. Pinhole pictures are very peculiar. Usually at very wide angle, they are also equally sharp at every point, the depth of field of the "lens" being almost infinite. Of course they're not as sharp as with a conventional lens but you don't go into pinhole photography for optical performances. On the other hand, the aperture is very small (f/235 on the Zero 6x9) hence very long exposure times : several seconds to several minutes in daylight, and up to hours at night. Pinhole photography is definitely not for people on the run. The Zero 6x9 is very simple to operate. Once the format is set and the film is loaded, there is nothing more to do than mount the camera on a tripod and go into the field. A tripod is mandatory as the exposure time in broad daylight on 400 ISO film is 1/2 s and quickly extends to several minutes when the weather is cloudy. An exposure wheel on the back of the camera allows to convert exposure times given by any ordinary light meter (picture on the left). One must not forget to add reciprocity failure though. To take the shot, simply slide the wooden shutter to uncover the hole then put it back into place when you're done. For short exposure times the hole can be uncovered directly with one's finger to avoid shaking the camera. A cable release adaptor is also available. On the right of the exposure wheel are the three windows of the multi-format film advance counter. One must not forget to advance the film as there is no double exposure prevention system. According to the pinhole tradition,The Zero 6x9 has a very wide angle of view (112° diagonally in 6 x 9 cm format) and no viewfinder of any kind, making the shots a bit random. Apart from being quite fun to use, the Zero 6x9 guarantees the interrogative looks of the bypassers. Prepare yourself to sound like a lunatic if one asks you for an explanation.